Panviman Chiangmai Spa Resort is set in the breathtaking terrain of the Mae Rim Valley, just an hour outside of the hustle and bustle of Chiang Mai. 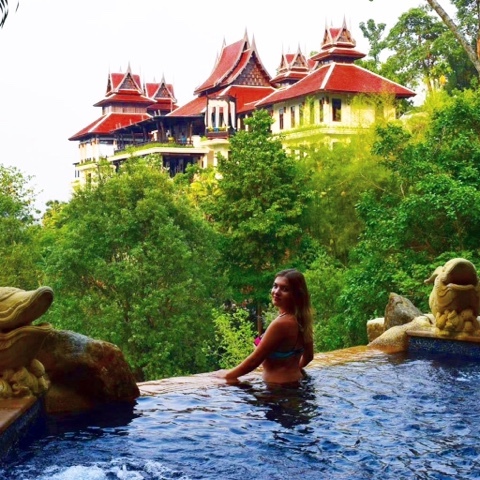 With peaceful waterfalls, three infinity pools, expert masseuses and even a peacock, guests will feel as if they've left the real world and entered a new relaxing one; 'Panviman' itself even means 'as if you are in heaven' in Thai. The check-in area is relaxing and beautiful - which was definitely the theme of our whole stay. On arrival, guests are presented with a delicious Blue Bean drink, refreshing towels and a token for the gift shop! The token can be swapped for a keyring, soap or a pencil, which is a lovely way to be welcomed. Arriving at our room we were also presented with a lovely fruit basket and delicious cookies. Set on a mountain, the walk to the rooms is pretty steep, but there are cute little buggies to take you and your luggage up. We actually LOVED the steepness, because it was good cardio. But if you're not into cardio, don't worry there are buggies to take you to your room - available all the time. 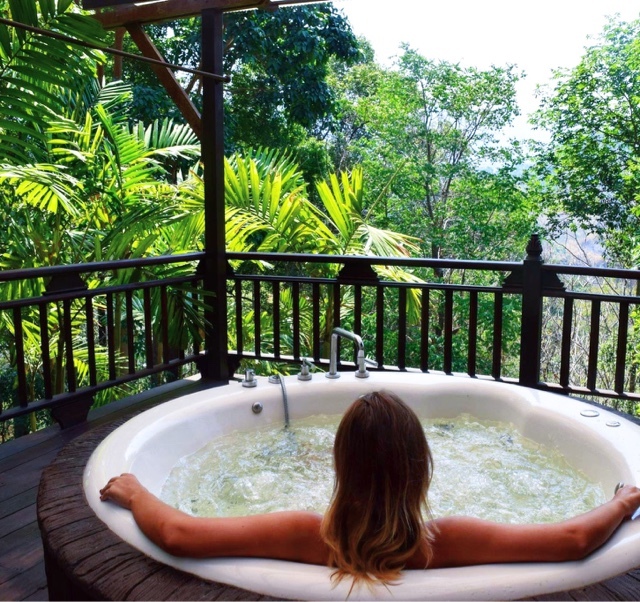 The Panviman Chiang Mai Spa Resort has six different types of rooms: deluxe, high mountain, steam villas, jacuzzi villas, pool villas and one family villa. We were in a jacuzzi villa and it was fabulous. It was decorated in a traditional Thai way with high ceilings, lots of beautiful wood and wonderful artwork. Our bed was absolutely massive (we could have comfortably slept across it)! Our favourite part of our room though was the balcony. We had our own private jacuzzi there! We were surrounded by woodlands and could relax to the sounds of nature: birds, crickets and even the peacock! At night the moon shone directly opposite and it was amazing. Panviman Chiangmai Spa Resort boasts a gorgeous Panorama Restaurant, which is open from 10am - 10pm both for guests and visitors. We tried out two Thai classics: sticky mango rice and deep-fried bananas. Both were delicious. We really recommend that you stay at Panviman Chiang Mai Spa Resort, but if you don't get the chance, definitely make sure that you have lunch and/or dinner here. They served some of the best meals we've ever had in Thailand! Panviman Chiang Mai Spa Resort has three beautiful infinity pools: one for children, one with jacuzzi jets, and a deeper one with an amazing elephant statue. Even I (an avid gym avoider) had to admit that I loved this gym and spent a good 30 mins here with Tanbay (the avid gym goer). I loved the fact that this gym was open to its natural surroundings, with lovely scenery to take in whilst working out. Furthermore, it had yoga mats! Breakfast was delicious and coupled with panoramic views. Like most Thai hotels, it offered cooked breakfasts, yoghurts, fruits, Thai options, cereals and toast. But unlike most South East Asian hotels, Panviman Chiangmai Spa Resort goes a step further: lots of their fresh fruit and veg is grown organically on-site. When we visited we were full on carnists (hence the bacon and egg photo), but there were plenty of options for vegans too. It was the perfect place to relax and, well, meditate! 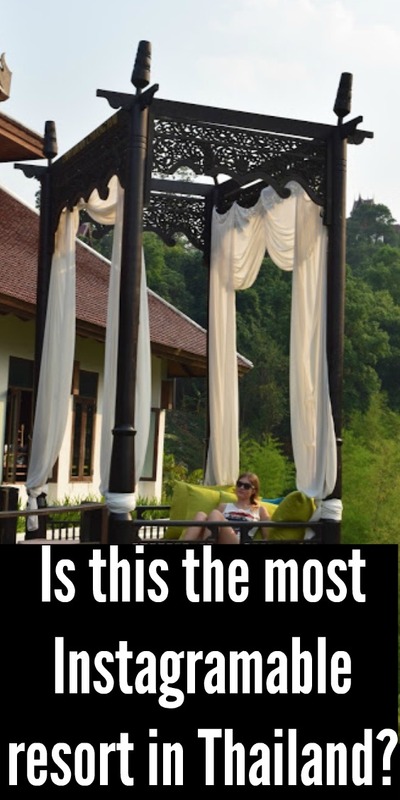 One thing that really made the Panviman Chiang Mai Spa Resort stand out, was the fact that the staff there are so lovely! We're all used to being welcomed at the front desk (hopefully!) but more often than not most other members of staff that you meet at the hotel will ignore you (or even glare at you). Panviman Chiangmai Spa Resort's staff weren't like that at all, everyone we met: the front desk, the waiters, the cleaners, the gardeners, the drivers, smiled at us and said good morning/afternoon. It really helped to make us feel at home and very comfortable. Speaking of feeling comfortable, Panviman Chiangmai is not just a hotel, it's also a spa, and a very fine one indeed. The spa offers a lot of different treatments from facials to massages. We were treated to a 90-minute aromatherapy massage and it was incredible!! First, we were given a choice of different aromas to choose from, we were also asked our preference regarding soft, medium or hard treatment, and then we were asked which areas we wanted working on and which (if any) we would prefer to avoid. This is so important!! Almost all of the massages we've had in Asia have involved our stomachs being massaged, which I hate (it always hurts and/or tickles). Anyway, we were able to specify that this should be avoided which was excellent! Then our feet were washed and massaged whilst we enjoyed a serene view of the beautiful pond. We were then led around said pond to the massage room. The massage was one of the best we've ever had! Panviman Chiang Mai Spa Resort is set 30km from Downtown Chiang Mai. As it's so separate from city life it is extremely peaceful and relaxing. But for those who still want a slice of city buzz, the Panviman Chiang Mai Spa Resort actually offers a complimentary shuttle service to and from town! Despite having access to the shuttle service, we had no desire to go into town at all. 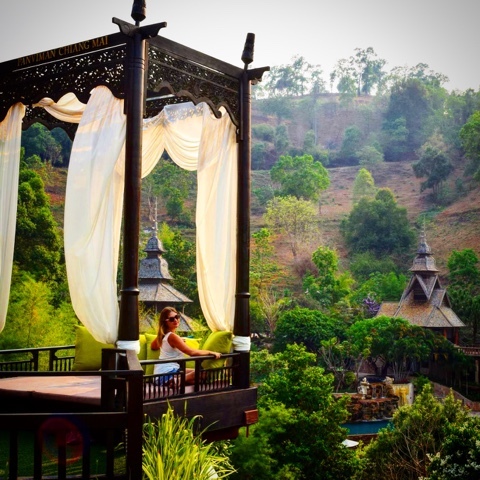 This was because the Panviman Chiang Mai Spa Resort hosts an extensive array of activities. These are all complimentary! They also host Thai cooking classes for you, and often use their own fresh, organic produce in class. If you love Instagram and Pinterest, you must come to the Panviman!! This is without a doubt one of our favourite hotels in the whole world. The pools, the jacuzzi, the massage, the food, the views, the activities, the staff.. everything was perfect and better than we could have even imagined! You must stay here! Disclaimer: Travelling Weasels were invited as guests of Panviman, but as always all opinions are our own. We absolutely loved it here and hope you do too!